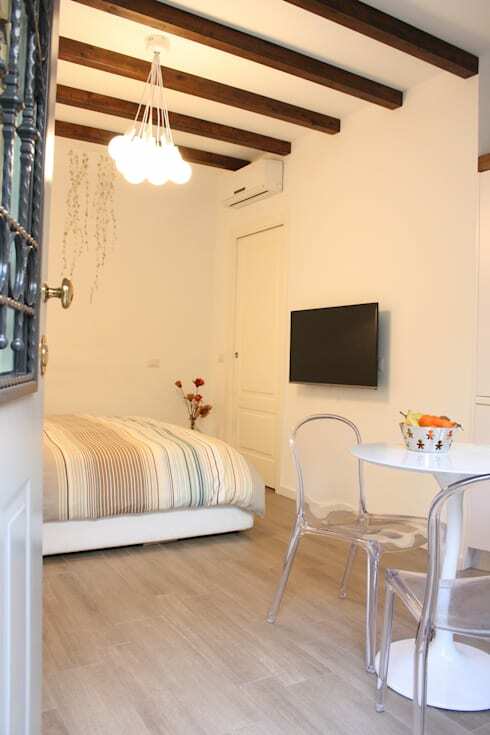 We know that Italy often features very small homes or apartments that are multi-functional and innovative. Today, we are going to travel to Milan and witness just how multi-faceted a single home can be. 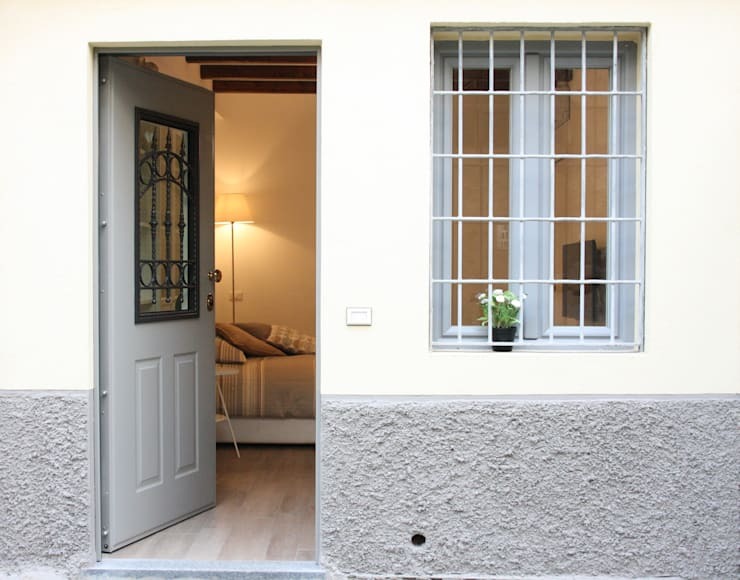 Designed by professionals Studio Ferlazzo Natoli, this little home is honestly exudes sweetness. We will also learn how we can make the most of every inch of space available in our own homes as well as appreciate the size and space that we have available to us. In fact, it will be hard for you to believe that this home is only one made up of one room! Are you ready to take a little peek? From the outside, we really get a sense of how small the home is. Located in the bustling capital, every square inch need is capitalized on. We can see that the designers have gone for a very country cottage look and feel with creamy white walls and a grey/purple touch in the form of the bottom of the facade and the window frames and burglar bars. The front door also adds a touch of color with the grey/purple tones. There are also little bits of detail added throughout the facade, which are subtle yet sweet, quaint and elegant. The little pot plant with the flowers adds a natural touch, while the wrought-iron bars across the front door is functional yet stylish too. If we look inside the home, we can see how the bedroom doubles up as the living room, which doubles up as the dining room. This is truly an integrated space! The tones used throughout are very subtle, warm and earthy, while the ceiling beams bring a gorgeous rustic touch to the home. The designers have gone for light tones to give the impression of space and airiness – a must for any small home. You'll also notice that the home isn't littered with decor items or pieces of furniture. Less is more when there are limited meters! You may also be interested in these 6 stylish ideas for a small home. If we look at the room from this angle, we can see how the designers used lightweight furniture and a simple design. There is also plenty of storage space in this little home, keeping personal items neatly stored away, freeing up space. On the right we can see a shelf and cabinet, where linen and clothes are stored carefully away. Next to the little dining area, there is a stack of shelves for cutlery, crockery and glassware to be stored, while still remaining easily accessible for diners. We can also see how the designers have added a splash of colour here and there. Don't you love the little dash of turquoise and the touch of grey? This brings life and charm to the home, without overwhelming it. 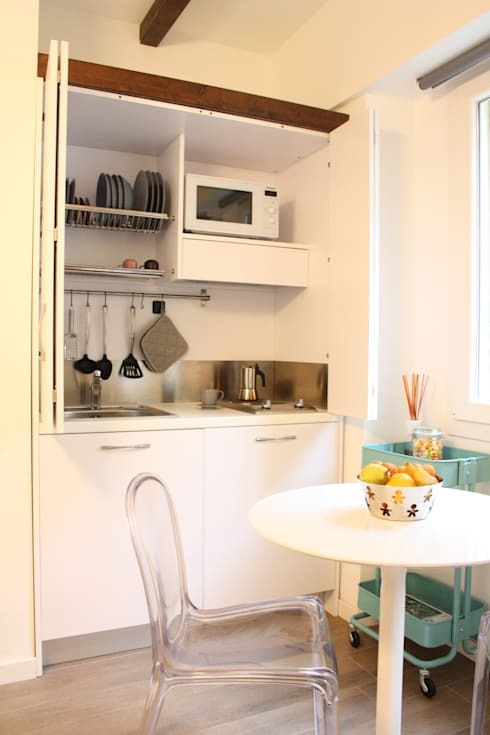 If we go into the little dining area and open up the cupboards, we come across a kitchenette! This is wonderfully innovative and creative. What more could you need? The great thing about this design is that when you aren't using the kitchen, you simply close the cupboard doors and all of the dishes and cooking tools are stored neatly out of sight. This keeps the home looking clean, neat and minimalist. Have a look at this other flexible furniture for a small home. The designers managed to create a spacious and homely bathroom by eliminating the tub. This is a great tip! If you don't have space, don't have a tub! This frees up room for a large, modern and luxurious shower. 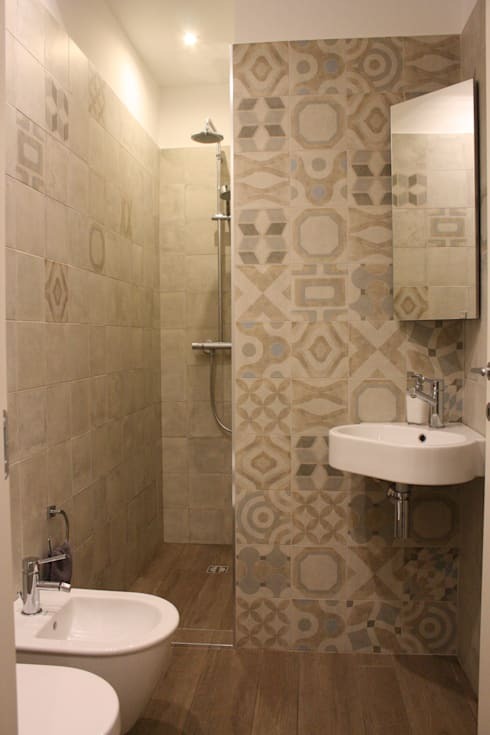 The designers have introduced some patterned tiles into the bathroom, which give it a sophisticated edge. Tiles are a wonderful material for the bathroom as they dry very quickly, last for years and years and are budget-friendly. They also come in so many colours and patterns that you can really get creative with your choice. The mirror in the corner of the room visually expands the small room, making it seem that much bigger. This is a great tip! Would you live in this little home?